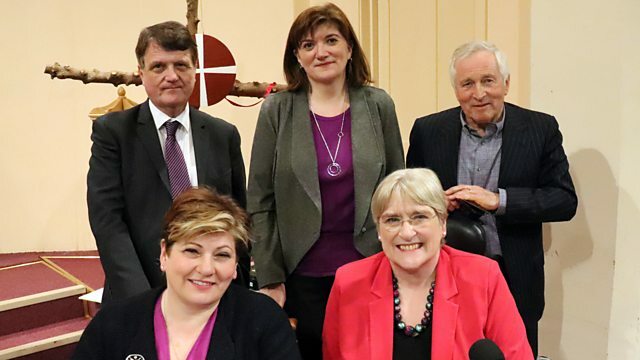 Jonathan Dimbleby presents topical debate from Stamford Methodist Church in Lincolnshire with Gerard Batten MEP, Baroness Sal Brinton, Nicky Morgan MP and Emily Thornberry MP. Jonathan Dimbleby presents topical debate from Stamford Methodist Church in Lincolnshire with a panel including the leader of UKIP Gerard Batten MEP, the President of the Liberal Democrats Baroness Sal Brinton, Chair of the House of Commons Treasury Select Committee Nicky Morgan MP and the Shadow Foreign Secretary Emily Thornberry MP. The panel debate whether Julian Assange should be extradited or not, Brexit, changes to the divorce laws and what are the essential elements of a good place to live?